Reading and share top 17 famous quotes and sayings about Sponsored by famous authors and people. Browse top 17 famous quotes and sayings about Sponsored by most favorite authors. 1. "I want to level the playing field for people who want to purchase health insurance as individuals, and that means eliminating the exemption for employer-sponsored health care." 2. "The American Academy of Nutrition and Dietetics is sponsored by Coca-Cola." 3. "Nationalism as we know it, is the result of a form of state-sponsored branding." 4. "Americans should be free to recognize our religious heritage; doing that is not the same as creating a government-sponsored religion." 5. "Ever since taking office, the Obama administration has sought to accommodate Islamist demands that freedom of expression be curbed, lest it offend Muslims and stoke violence. For example, in 2009, the administration co-sponsored a United Nations Human Rights Council resolution along those lines." 6. "Iran has long sponsored terrorists who carry out homicide bombings in Israeli cities. However, it is a mistake to believe the danger Iran poses is directed at Israel alone." 7. "Some in Westminster have talked about her receiving a state funeral when she dies, which seems a bizarre sort of tribute to someone who believed the state should do as little as possible. It would be far more appropriate to allow competitive bids from private companies to run the funeral arrangements. 'And we now go over live to Westminster, where state leaders are lining up for Lady Thatcher's funeral sponsored by McDonald's. And there we see the coffin respectfully borne on the shoulders of six part-time burger-flippers dressed in the official Ronald McDonald costume, before the private cremation when the body will be flame-grilled with gherkins and a slice of cheese. 'It's what she would have wanted." 8. "Because we're sponsored by competing breweries there is always competition. When we were both fighting for ninth or 10th place, nobody really cared except the two companies." 9. "Enrolling your child in a recreational sport sponsored by your neighborhood recreation community centers is a great way to keep kids active." 10. "Now I want to use money in a good way. 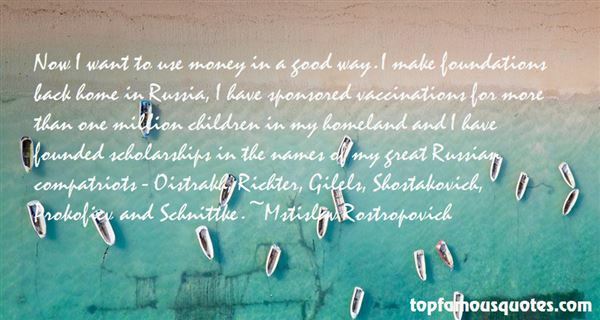 I make foundations back home in Russia, I have sponsored vaccinations for more than one million children in my homeland and I have founded scholarships in the names of my great Russian compatriots - Oistrakh, Richter, Gilels, Shostakovich, Prokofiev and Schnittke." 11. "War is legitimized state-sponsored terrorism in a grand scale." 12. "What the hell?" I asked. Is this daring escape being sponsored by Honda?" 13. "If you go out there and your main purpose is to get a sponsor, then it's not gonna work. Just go out there and have fun. That's how I got sponsored." 14. "In The Bloudy Tenent, Williams points out that Constantine "did more to hurt Christ Jesus than the raging fury of the most bloody Neroes." at least under the Christian persecutor Nero, who was rumored to have had the Apostle Paul beheaded and Saint Peter crucified upside down, Christianity was a pure (if hazardous) way of life. But when Constantine himself converted to Christianity, that's when the Church was corrupted and perverted by the state. Williams explains that under Constantine, "the gardens of Christ's churches turned into the wildernesss of national religion, and the world (under Constantine's dominion) to the most unchristian Christendom." Legalizing, legitimizing the Church turned Christianity into just another branch of government enforced by "the sword of civil power," i.e., through state-sponsored violence." 15. "As long as I had easy access to psychedelics at the government-sponsored research project, most of my energy went into psychedelic sessions." 16. 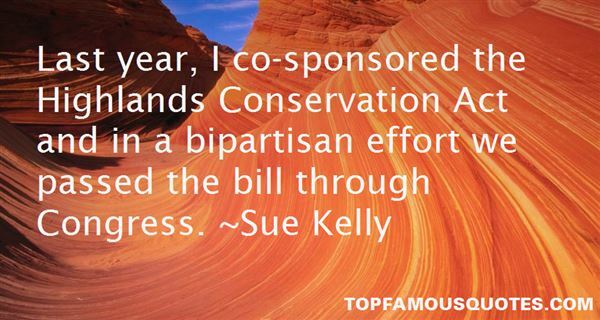 "Last year, I co-sponsored the Highlands Conservation Act and in a bipartisan effort we passed the bill through Congress." 17. "Today's symphonic music is sponsored by the upper structures of society." To Wallace Stevens' post-Nietzschean formula 'God and the imagination are one,' these women poets would add a crucial third element: God and the imagination and my body are one."